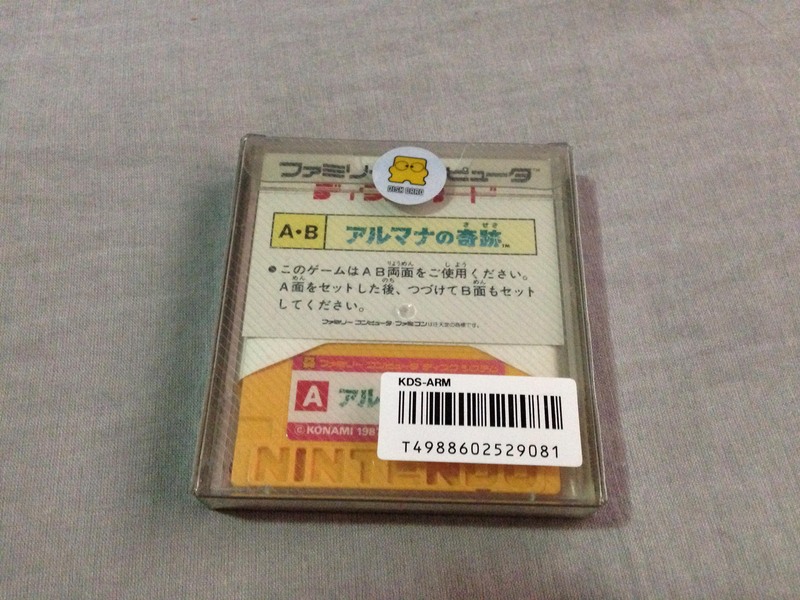 Miracle of Arumana (アルマナの奇跡 Arumana no Kiseki) – Famicom Disk System – Nintendo Sega Japan! 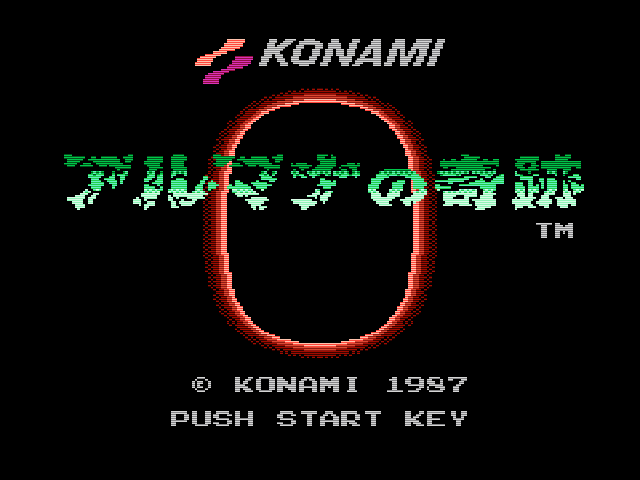 Of all the Konami Famicom/FDS games that didn’t leave Japan, this one is my favourite. The plot is a slightly more cartoony version of Temple of Doom – the miraculous Arumana stone has been stolen from a remote (presumably Indian) village by some powerful supernatural force, and without its power the people are helpless against the evil. The land is ruined and the peaceful locals have been turned to stone. 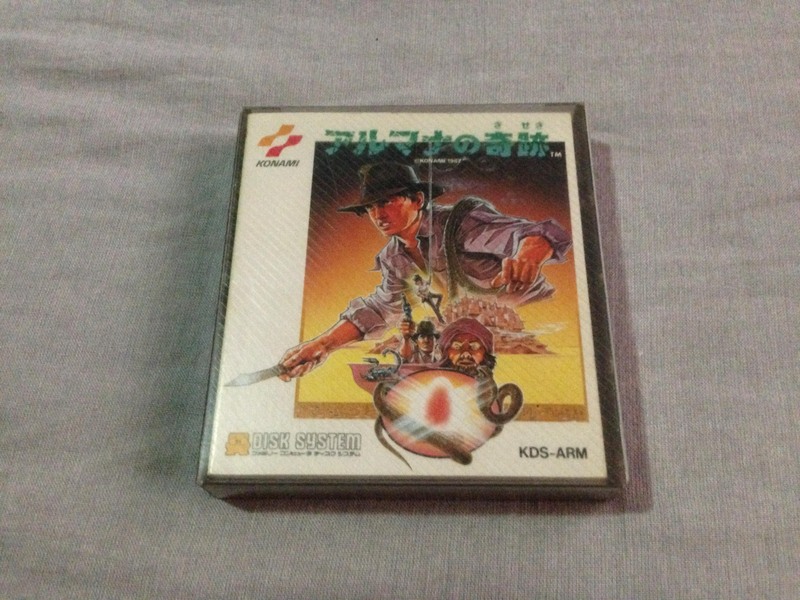 You play as a younger, more Japanese looking Indy, who has come across this injustice during his adventures and sets out on a quest to defeat the evil force and restore the Armana stone to its rightful place. It’s a jolly little platfomer with a fun (if not particularly accurate to the laws of physics) grappling hook mechanic. 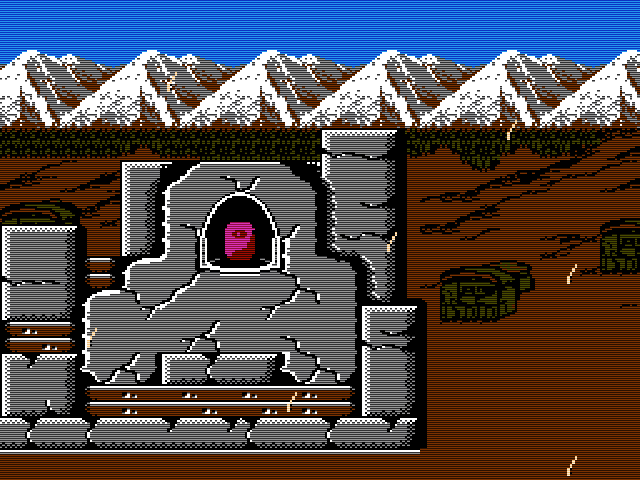 The hook feature is nowhere near as involved as the one in Bionic Commando, but definitely adds to the experience, allowing interesting navigation possibilities around the levels. What sets it apart are the graphics and music. 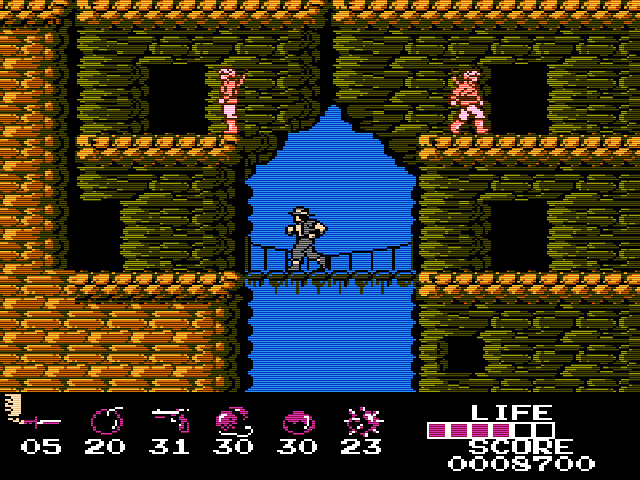 It’s in the top tier of that era’s Famicom games graphically, with that fantastic slightly gritty Konami look (including the trademark ‘faceless’ characters). The music is in my opinion literally the best use of the Disk System’s extra sound channels. 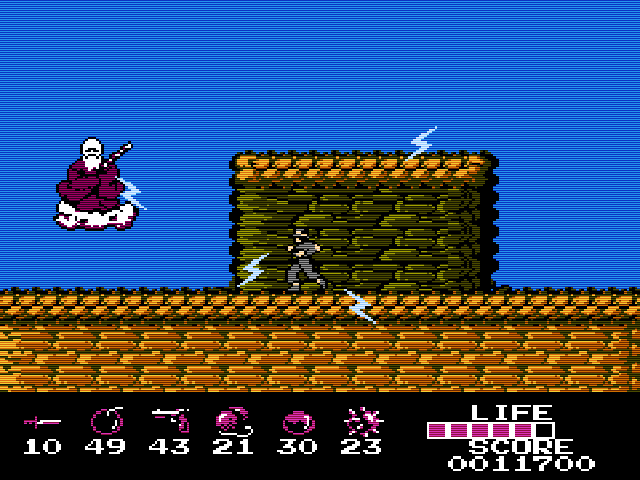 This is almost Akumajou Densetsu (Castlevania 3) level here, among the absolute best on the Famicom. 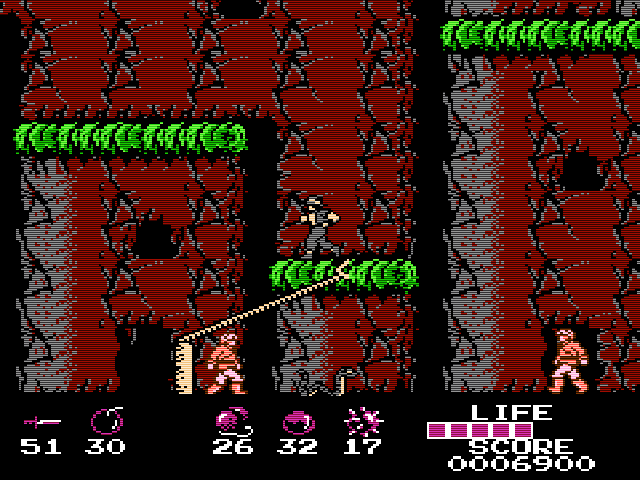 It uses the louder extra wave channel for a ‘horn’ type sound, for an 8-bit version of a classic adventure movie score. 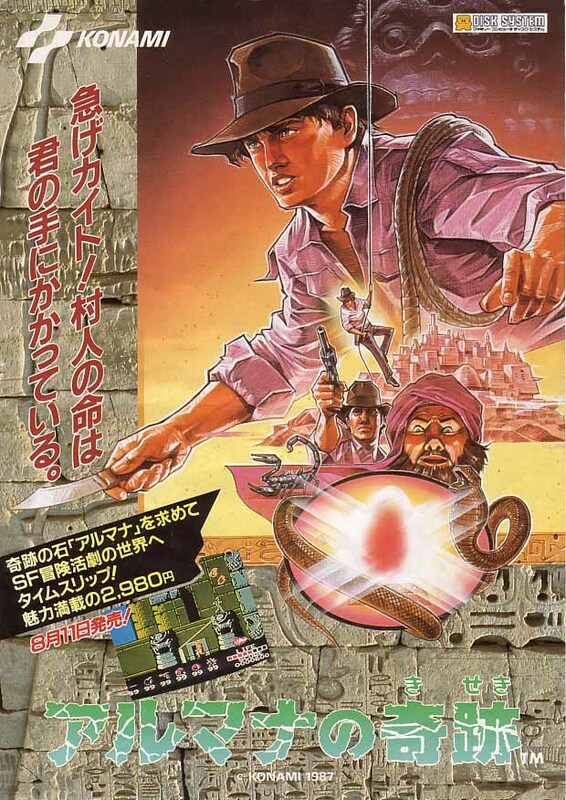 It’s also a vastly superior Indiana Jones game to any of the official 8-bit Indy games. In fact it’s the best Indy game on any consoles at all until the excellent Nintendo 64 version of Indiana Jones and the Infernal Machine. An English translated version is out there with the title ‘Miracle of Almana’. While that is legitimate translation of アルマナの奇跡 without context, it’s clearly incorrect. 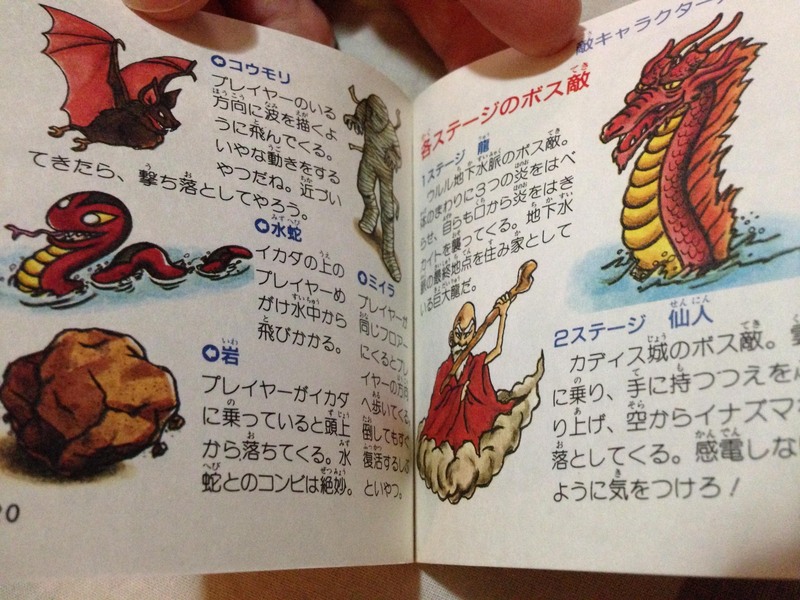 The product code of the game is ‘ARM’ – including the R means it was meant to be translated ‘Arumana’ or simply ‘Armana’. This is my sealed copy. This is an amazing game. If this had made it to the west, I’m sure it could have been a long running series, just like Castlevania and Metal Gear. But perhaps Konami were afraid of Lucasfilm’s lawyers. 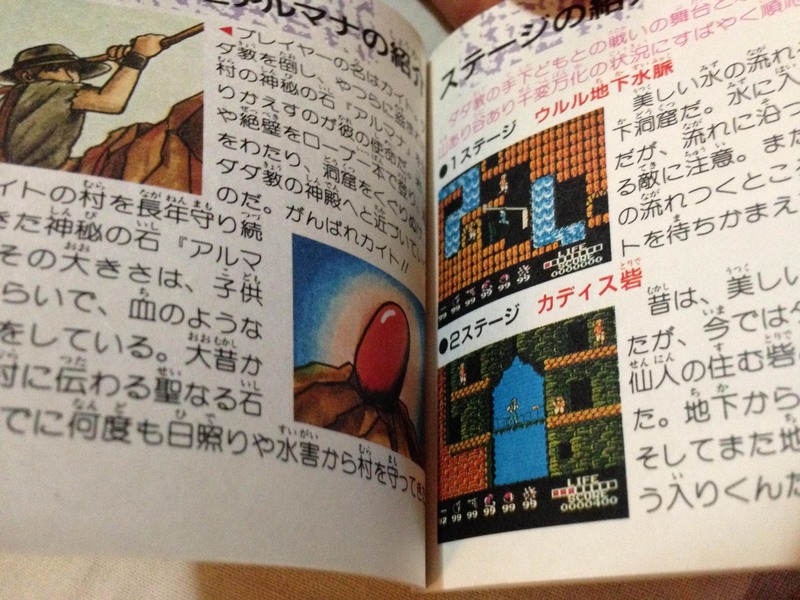 Full colour manual with that classic Konami manual art. 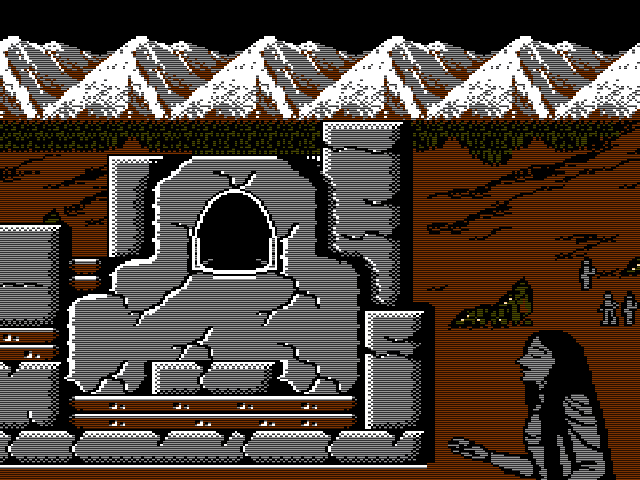 I first leaned about this game about 15 years ago on Tsr’s NES archive. The piece is still alive today, check it out! 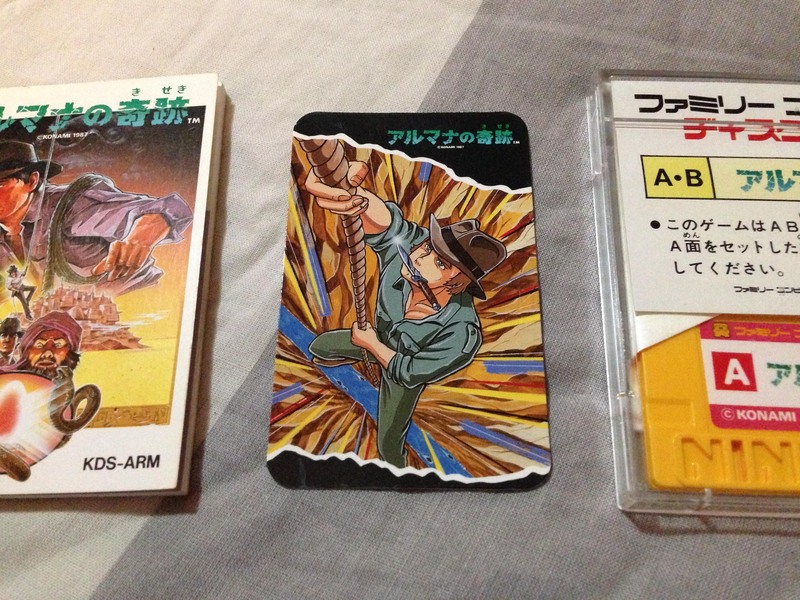 Pingback: 8/20 Konami Famicom Collector Cards – Nintendo Sega Japan!